Posted by janina on March 23, 2009 at 3:25 pm. 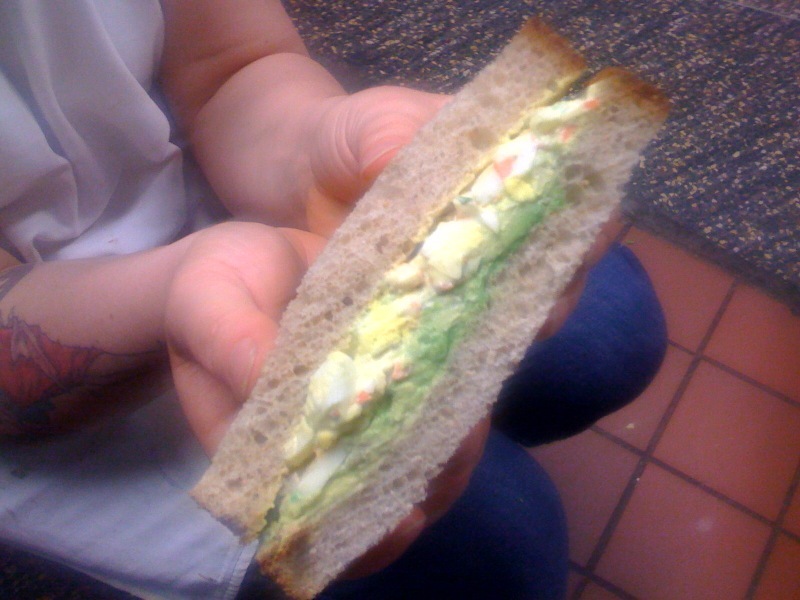 The Best Egg Salad Sandwich ever. EVER!! Thursday morning Nate found a folded up note in an open shopping bag that said “5 egg sandwiches please”. It was like someone placed it on the counter for us in the morning as a breakfast order- so we thought. “Who would request such a thing! They have another thing comin’!” But the more we thought about it, the more we wanted egg sandwiches ourselves… mmm… On a whim, I boiled some eggs intending to Nate, Jason and myself egg salad sandwhiches. 6 eggs, 2 a piece. Perfect. Except I forgot two more people were coming in that day. In a panic I started tossing a little bit of everything in the mix: apple, carrot, celery, onion, trying to extend the eggs and make them two thirds larger. In the end, I totally did it, and managed to make the best egg salad I’ve ever made. We used left over whole wheat bread from the shop, one side covered in avocado, the other side in bacon, or for me, horseradish cheddar. Here is a rough estimate of what went into the egg salad, I’m sure you could adjust to whatever you have in your kitchen, but I’m positive the apple and mint is what made the sandwich great. In the end, we ended up making 5 egg salad sandwiches, realizing the note was someones incredible forsight and not a request after all. Thank you mr mystery man.